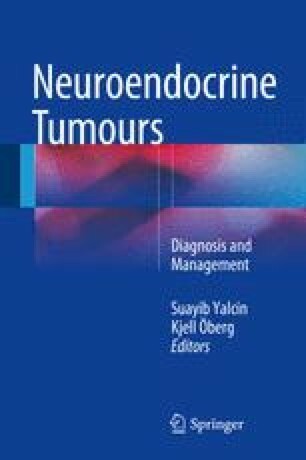 The term multiple endocrine neoplasia (MEN) refers to hereditary neoplastic disorder involving more than one endocrine organ and includes the MEN type 1 (MEN1), the MEN type 2 (MEN2), and the familial medullary thyroid carcinoma (FMTC). The estimated frequency of each of these syndromes is around 1 in 30,000 and is characterized by complete penetrance with variable expression [1, 2]. The recent progress in our knowledge of both the molecular and the clinical genetics of these syndromes has improved the clinical management of the patients . On the one hand, the MEN1 gene, a tumor suppressor gene responsible of MEN1 syndrome, is involved in the regulation of several cell functions (e.g., DNA replication and repair and transcriptional machinery). On the other hand, the RET proto-oncogene encodes for a receptor tyrosine kinase protein whose expression is fundamental for appropriate migration, development, and differentiation of neuroendocrine cells originating from neural crest . Currently, DNA testing allows the early identification of germline mutations in presymptomatic mutant gene carriers in the MEN syndromes . Consequently, an early identification of the MEN-associated neoplasms and the genotype-phenotype correlation improve the outcome and the quality of life for affected subjects .